JetBlue saw its fuel costs climb by 48% in the third quarter compared to last year. The airline still managed to turn a profit, but its stock has been sinking all year, down 27%. One Wall Street analyst says rising fuel costs could actually be good for airlines, as it forces them to focus on capacity. 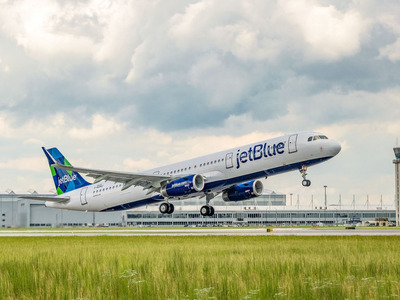 JetBlue‘s fuel costs surged nearly 50% in the third-quarter compared to last year, the airline said Tuesday, eating a big chunk out of its bottom line. The New York-based airline’s Aircraft fuel and related taxes rose to $US515 million for the quarter ended September 30, 48.4% higher than the same period of 2017. That translated to an average price per gallon of fuel of $US2.32, up by 37% over last year, for the 222 million gallons of fuel its planes burned. JetBlue was still able to eek out an adjusted profit of $US0.43 per share, roughly in line with Wall Street’s expectations, and expects to stay on target for its full-year guidance despite the fuel charges. But at the end of the day, the fuel charges will still likely hit travellers wallets in the form of price hikes. While rising fuel costs are pushing some airlines like JetBlue to look for cheaper and potentially more environmentally friendly fuel options, Wall Street analysts have said higher fuel costs could actually be a benefit for airlines. That margin pressure is front and center for JetBlue management. 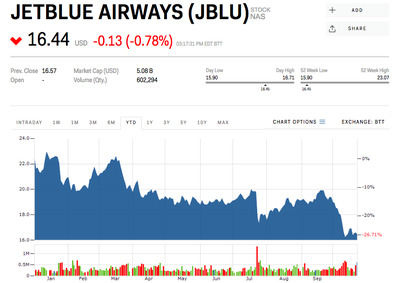 Shares of JetBlue fell about 0.7% in trading Tuesday following the earnings release and are down 26% since the beginning of the year. Oil, on the other hand, is up by about one-third in the past year.